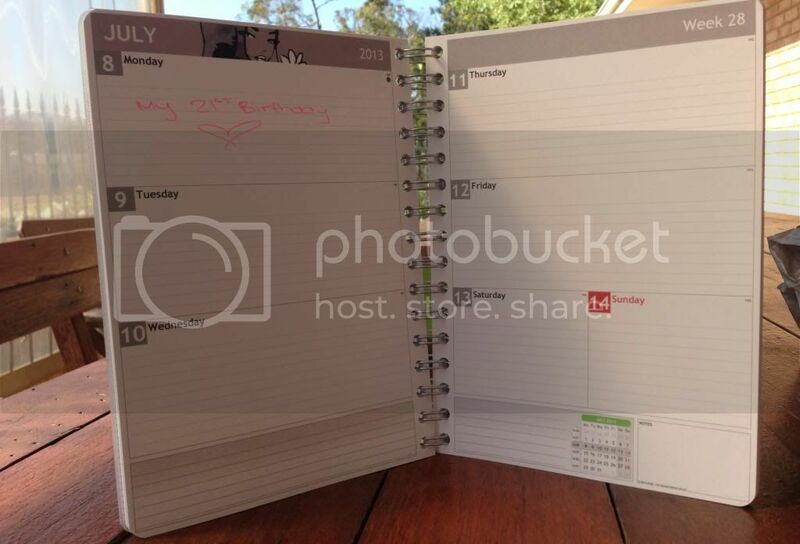 Born to Buy: Personal Planner Review and Giveaway! I am one of those super freaks that loves stationery. I love the feeling of writing on new paper, especially the when both sides are unused (I know you know what I mean). I love buying it, I love using it and, well, I love running out so I can start the cycle again. Much along the same lines as stationery, I love being organised. If you know me personally or follow me on Instagram or Facebook, you'll know that I like to write my blog posts in advance and schedule them to upload so I can be sure they're going up. To keep track of my post uploads, I have months ruled out on pieces of paper with posts and ideas penciled in. On top of that, I like to keep a diary that fits my personal dates and plans, as well as blog commitments. Finding a diary that meets all of my requirements can be hard (I'm a woman, and a picky one at that), which is why I love the idea behind Personal Planner so much. Personal Planner is an ingenious company designed so people can customise their diary to the greatest detail. 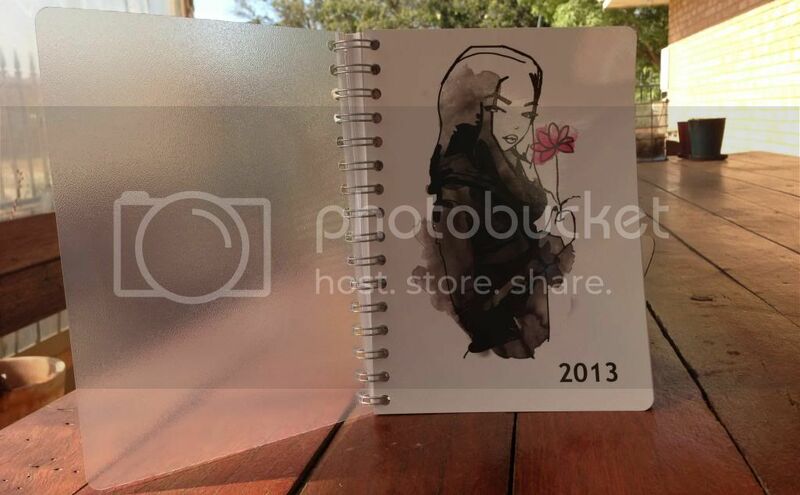 Thanks to the lovely people at Personal Planner I had the opportunity to order my own planner recently. I've looked into these planners so many times before but never actually placed an order, so I'm so excited to have ordered one! For the process of ordering a planner, keep reading. Also, as this post's title suggests, I have a giveaway at the end of this post so let's get going! Personal Planner home screen. Doesn't it just make you want to be organised? If you have a chance, read the About Us section. It's really interesting. The first step is choosing what you want to order, of course. I chose to order a planner because, as I said, I want to be able to keep track of everything. Plus, I have a million notebooks lying around. Does anyone else find that they just accumulate? The first step in the ordering process is choosing the size of your planner. Given that there's so many options, I really think there's something for everyone. 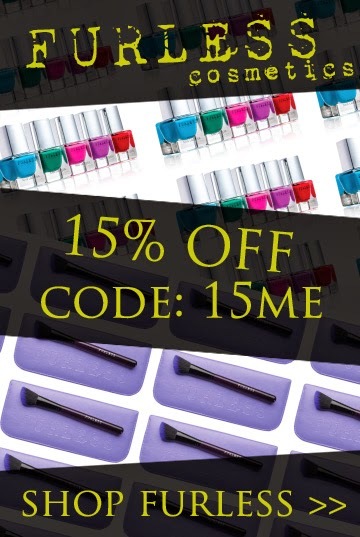 As you may have seen from the image, the price includes shipping. I chose an A5 planner. I don't like the shape of the large and the others seem too small for what I want. Plus, A5 is the perfect handbag size. This is where a lot of the customisation takes place. The tabs on the top show different designs available. Each year a graphic designer creates five designs, each with four different colours. If none of the designs appeal to you, there's always the Original Edition. 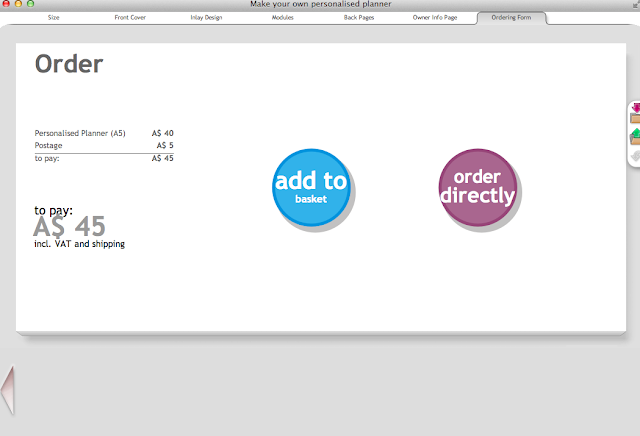 In Original Edition, the colour of the background and text can be customised. You can actually have a photo on the front of your planner also, however I'm not sure I want to see myself every day when I go to check my plans! I loved the 2012 designs. As you can see I selected the third design in the fourth colour! For text I chose to just have the date on the front of my planner. I also didn't want my name on the front so I opted for the year only. Given that I'm ordering my planner at the end of January, I chose to have it start in February of 2013. The planner goes for 12 months meaning that it will start the 2014 New Year with me! Finally, I had to choose the colour of the electric closure. The design defaulted to white elastic, however I thought pink looked so good, so I chose that! 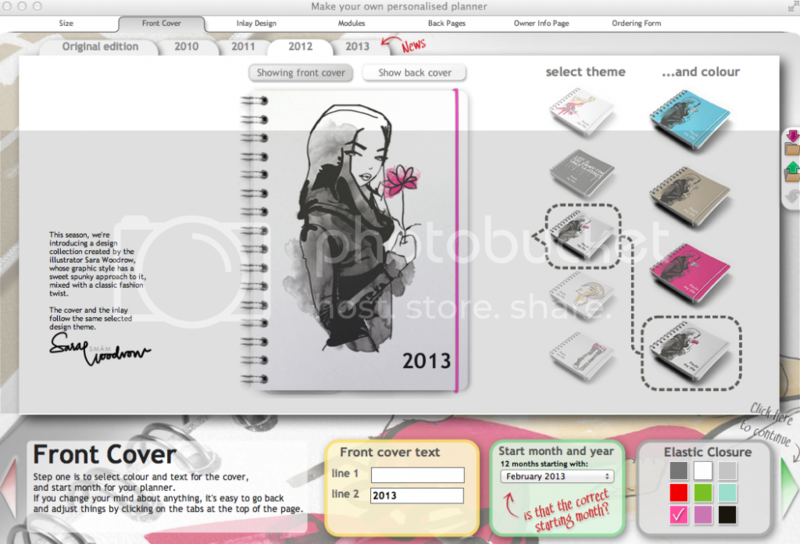 After choosing the front design of the planner, it's on to what Personal Planner refers to as the Inlay Designs. Basically we're getting down to the days. 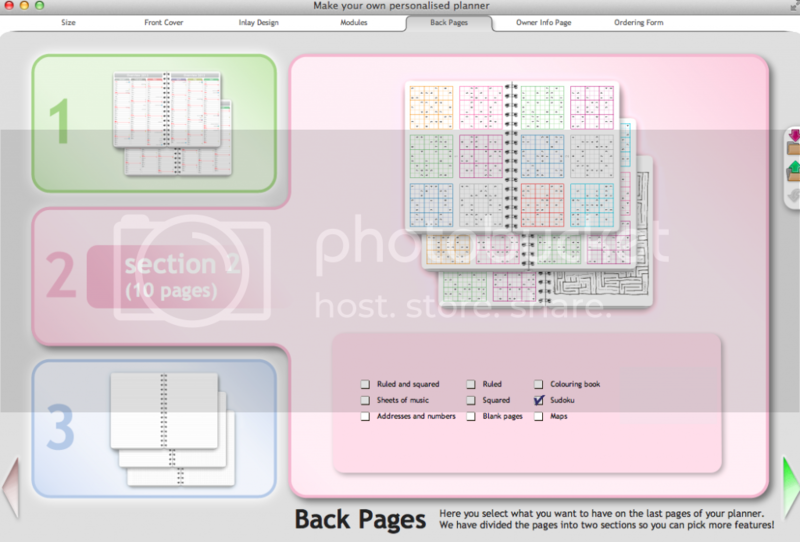 There are four different layout designs to choose from. I chose to have the whole box filled with lines because I hate that my writing isn't always straight, however you can choose to only have half lined. A ruler comes in the diary, of course, I chose for mine to be pink! There's an option to choose 'Daily Details' for your planner, but I'd prefer to write things in as I choose. 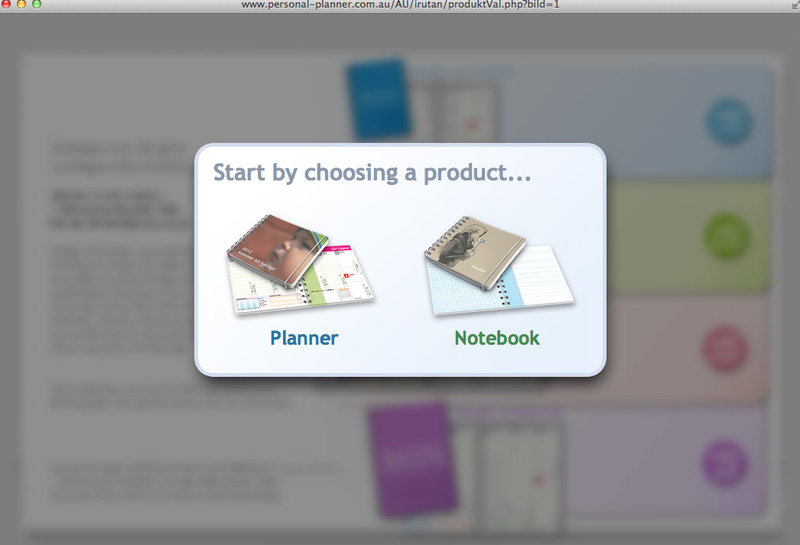 Finally, let's choose how we utilise the rest of the space in the planner! The arrows indicate different 'blank space', as well as the various options. Once again, I chose for it all to be ruled. In hindsight, I could have chosen for it to be blank but I love lines. They're so unrestrictive and it means I can write anything. This will probably be where a lot of my blog 'To Do' stuff is written. 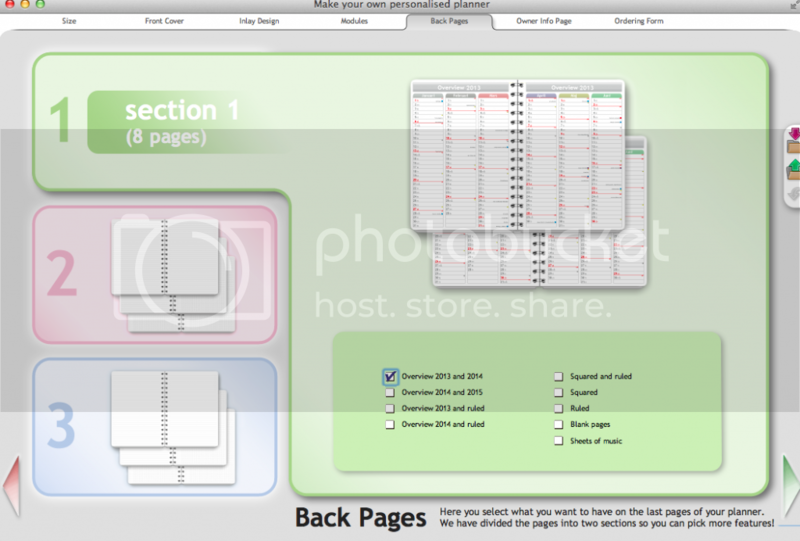 Back Pages is basically 58 pages of customisation. 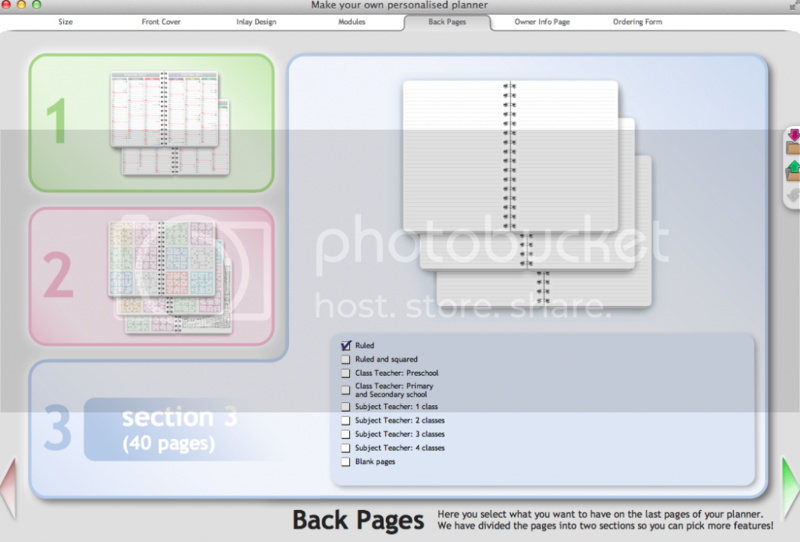 In three incriments (Section 1, Section 2 and Section 3) you can choose how the final pages of your planner can be used. I chose for the first 8 pages to be an overview of 2013 and 2014. From what I can tell, each page will have three months on it. I catch the train a fair bit so I chose for the next 10 pages of my planner to be sudokus. I love having something to do on the train and I used to do sudokus all the time. I'm looking forward to getting back into them. Finally, I chose to have the last 40 pages at the back of my planner just be ruled. There's so many things I will use this for. I love writing blog ideas, product thoughts and, well, anything else so it will be nice to have somewhere to actually write it. 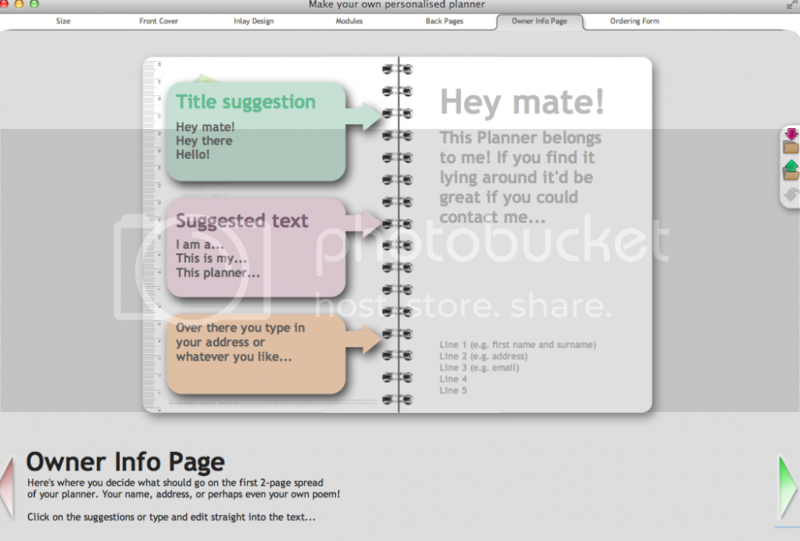 The first two pages of your Personal Planner have your contact details. You know the one, surely. Instead of filling it out by hand, however, you can fill it in during the design process. On the left you can see the different wording options that they suggest, however you can choose to have whatever you want written. I chose the default because, well, I didn't really mind. Finally, place you order and in approximately three weeks (mine took just over two weeks including the weekend and one public holiday) you'll have a beautiful and personalised planner. Before I get into the competition, I want to show you a few photos of mine. I love it so much. When your planner arrives it comes with a few pieces. The plastic sleeve, elastic closure and ruler come individually and must be put into place. It's all very easy to do and takes about two seconds. Okay, and now for the much awaited giveaway! Not only did the lovely people at Personal Planner allow me to create a planner, they gave me a gift voucher to give to one of my beautiful readers! 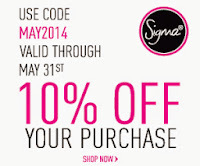 This voucher is valid for up to $45 so any of the planners can be purchased. This Personal Planner giveaway will be open for three weeks, ending at midnight April 4, 2013, and the winner will be announced soon after. If you are under 18 years of age, please get your parents permission before entering this giveaway. I don't want you giving your address to me without their consent. Finally, this giveaway is open to Australian readers only. If you're not an Australian reader, I apologise and I hope to hope an international giveaway soon! I stay organised by writing everything down. It's the only way for me lol An personal planner/organiser would be great! My top organizational tip is actually to use a planner. I harp on high school students all the time who don't and can show them mine to prove my point. I substitute teach, so I would be lost if I didn't have a planner. I literally wouldn't know where to go on a given day. My top organisational tip is to check your diary before going to sleep every night so that you don't forget what you have on for the next day! 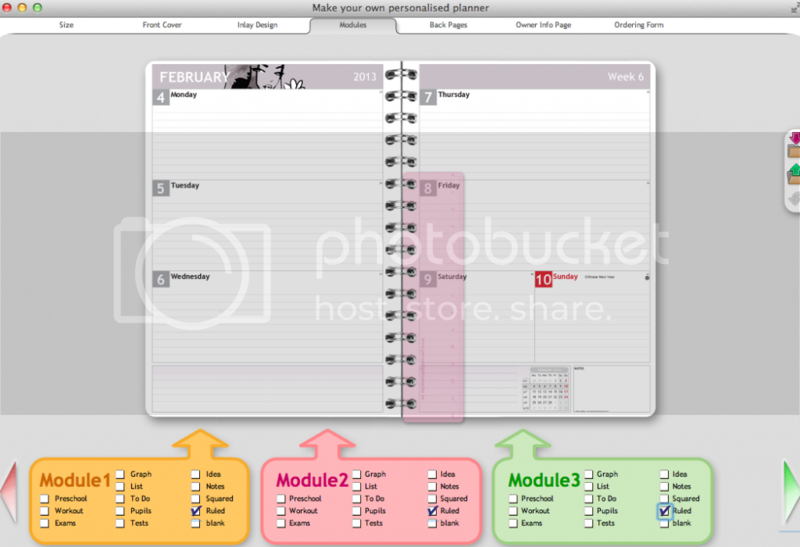 My top organisation tip is to love what you are using to be organised. I am a stationary junkie and love cute stationary! 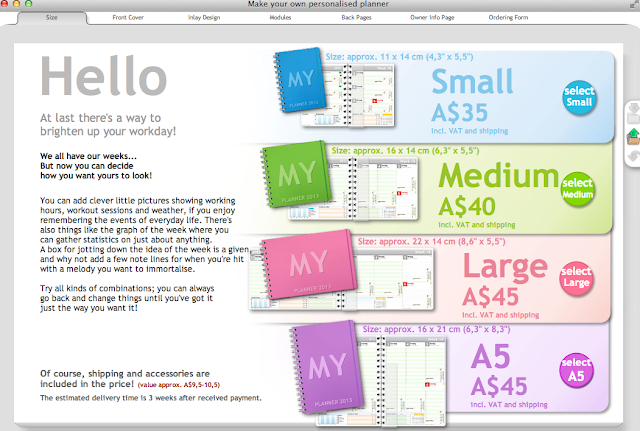 These personal planners are such a great idea!! And the price is actually REALLY reasonable! I want one!!! I keep a little diary in my handbag so when I need to schedule appointments I know that I am free to do so. 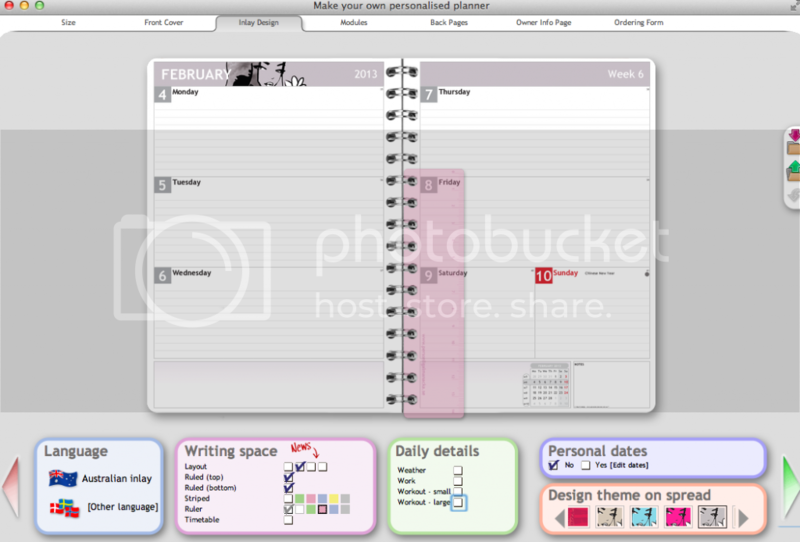 Amazing Organiser Its looks like the perfect way to keep you motivated! I absolutely LOVE Personal Planner!!! I have one at the moment but it's almost coming to an end, so winning this would be fantastic timing ;) haha! Before I had a personal planner, I was a bit lost in terms of blog posts etc, so this has certainly changed the way I blog and made life a lot easier! I love these planners - how perfect! I love sitting down for half an hour on a Sun night and planning my meals and activities for the week ahead - seems less hectic if I know what is going on! I keep a monthly calendar on the fridge so I will see it every time I go to get something and it will also remind the hubby....which he needs! These look great my top tip is make lists i make them for everything they keep me organised and focused. Lists are your best friend in the organization game. Write one daily and TICK OFF as you go. Ticking off is key! It helps keep you motivated and focused whilst also making you feel proud of your achievements. I don't know if I have a "top" organisation tip because I really struggle with organising, even though I love it! 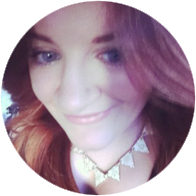 I also like to schedule my blog posts well in advance so at the beginning of each month or week, I use evernote to plan what I will be posting for that month, and I spend each Saturday or Sunday drafting posts. For day-to-day things, I use a diary which is great for being able to write things down in quickly and crossing things out, and quickly checking if I'm free on certain days. My main issue is not checking it enough! My top organisational tip is to put everything in date order - whether it's filed away, written on the 'to do' list, or even stuck on the fridge! I have a notebook with my daily to-do lists by order of importance. I also use different colored post it tabs to color code everything. I stay organised by syncing up my Outlook and Google calendars and my phone. Generally, this works very well, but recently something went awry and I missed an important appointment. Hence...thinking a hard-copy back-up is a very wise move! Looks like a great way to customize a cool diary! I don't need a planner because I'm disorganised, I need a planner because I'm organised. If anything this planner will help me plan better as I'm a planner type of person who only isn't a planner when I have an inefficient planner. I always write a list of what to do each morning and I cross of as I complete each task.